The high-powered AMG versions are just around the corner. Mercedes-Benz had every reason to bring Arnold Schwarzenegger to Detroit to help unveil its , the first time in its 39-year history it has undergone such a dramatic change. While automakers are readily ditching SUVs in favor of CUVs, Mercedes is committed to . According to an discussion with Mercedes USA CEO Dietmar Exler, the plan is to not only increase sales but also to expand the G-Class lineup. “We will be curious and test the waters for special editions," Exler said. For example, it’s widely rumored the first of hopefully several G-Class AMG trims will debut next month at Geneva. At the moment, there’s the AMG G63 and AMG G65. "The AMGs are not going to be far away," said Ian James, marketing manager for the G-Class. "In the more recent history of the G class, the AMG vehicles have been wildly popular, and it fits the image, the craziness, if you like, of the G." Our best guess is that, at the very least, the new G63 will premiere at the Swiss show. 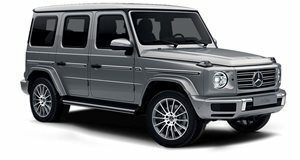 Beyond that, not only does Mercedes want to increase overall G-Class sales both in the US and abroad, despite a small price increase over the outgoing model, word has it additional variants are being explored. For example, the previous G generation spawned the wonderfully opulent G650 Maybach Landaulet and the ‘Let’s go crush some wild animals just because we can’ G500 4x4 Squared. There are many possibilities Mercedes can choose from, and we doubt anyone would object to another G63 6x6. Given that last year Mercedes-Benz sold 4,188 G-Class SUVs in the US, an increase of 6 percent from 2016, the future is looking mighty bright for the redesigned model. Last year was also the first time the G-Class sold more than 4,000 examples in the US alone since it arrived in 2001. With a sales revival like that, Mercedes knows it has to ride this wave for as long as possible.